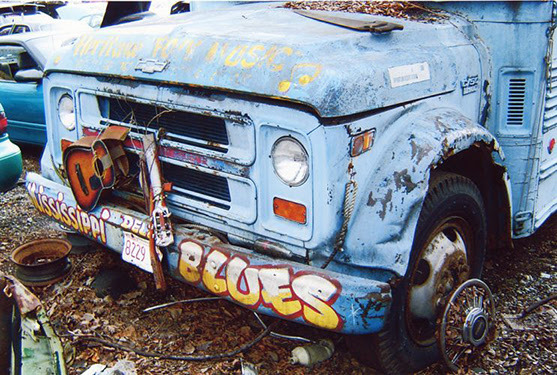 The iconic Blues Bus originally operated at the historic Maxwell Street Market under the ownership of its creators, John and Marie Johnson, who travelled in the 1972 Chevy bus painted blue to sell recordings of blues music. Stored by benefactors to the Maxwell Street Foundation on gated parking lots since 2004, in September 2018 vandals successfully removed the most colorful and valuable front end portion of the bus with the engine, and further stripped the interior and removed all the windows and both doors. Foundation members alerted about the vandalism found the entire front end of the bus skillfully cut away, and were serendipitously on-site to refuse the tow truck that arrived to take the rest of the bus away for scrap. 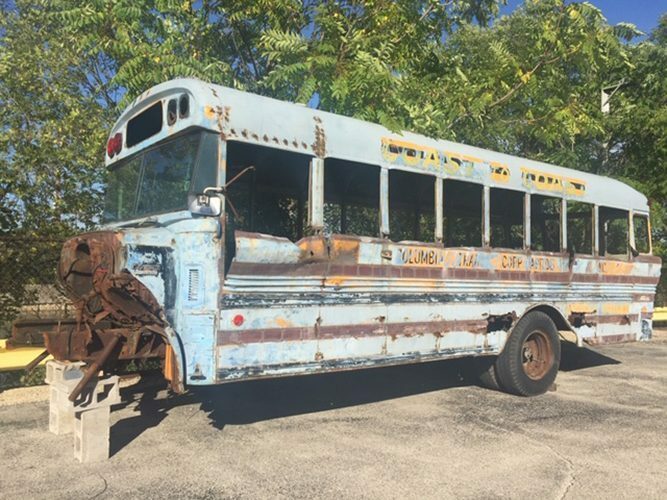 Foundation members subsequently arranged an alternative location for the bus to be towed in order to further assess its preservation as an artifact and icon of the historic Maxwell Street Market. 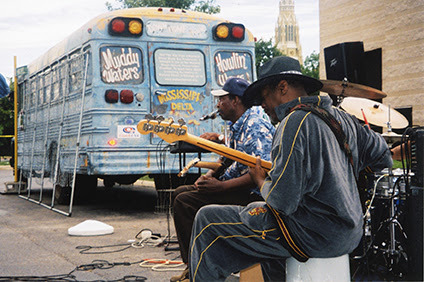 In 2004, the Maxwell Street Foundation had resurrected the non-operable bus with permission of its owner from a location on Chicago’s South Side, and created programming to celebrate the connection of the Blues Bus to the historic Maxwell Street Market. An original street theatre piece based on characters in Ira Berkow’s book, “Maxwell Street: Survival in a Bazaar” (Doubleday, 1977) was performed free in front of the bus towed to outdoor Chicago venues. Interpretive exhibition panels mounted on one side provided historic context, and blues musicians performed authentic Chicago blues music around it. Photo credits above and below: Robert Weiglein, photo copyright 2004, all rights reserved. Photo credits below: Steve Balkin, 2004. 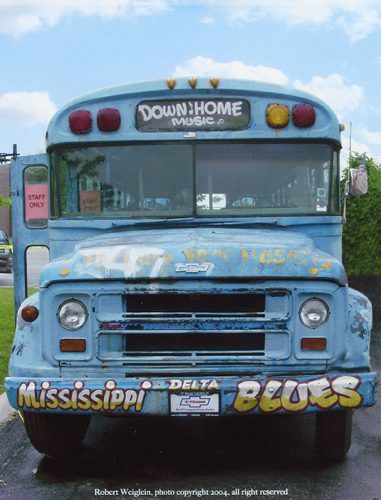 In 2008, the Blues Bus made its debut at the Chicago Blues Festival where it continued an annual presence through 2010 manned by members of the Maxwell Street Foundation, in partnership with its owner. It made a final public appearance in 2010 on Labor Day weekend at the New Maxwell Street Market, again coordinated by the Maxwell Street Foundation in partnership with its owner. 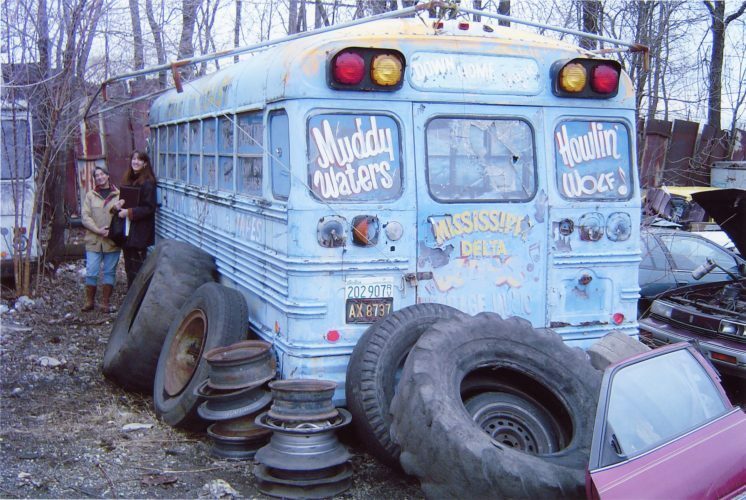 Following this final appearance, the Maxwell Street Foundation retired their use of the bus to the owner who has not claimed it and gives the Foundation his blessing for efforts at restoration. 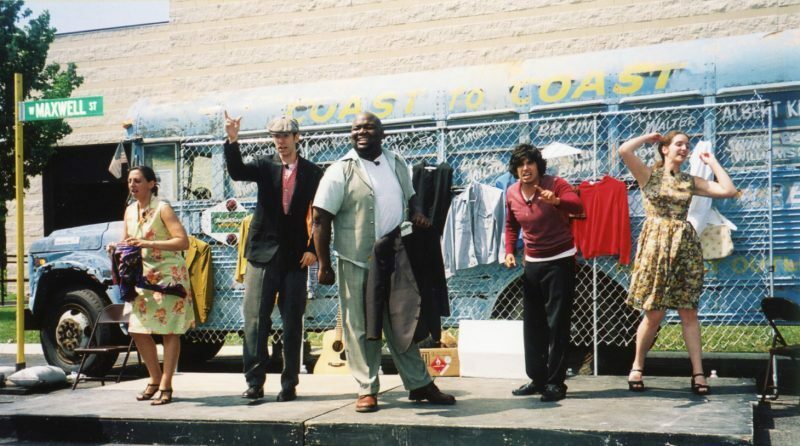 The Maxwell Street Foundation seeks a fellow steward and partner, or “angel”, to tow the bus to a destination where it can be creatively reconsidered and befittingly re-purposed in celebration of its heritage. With only a vestige remaining of the once colorfully painted bus with blues logos and artfully painted blues musicians’ names on its sides, back and front, the body of the bus still remains a touchstone to its heyday at the Maxwell Street Market. Please contact the Maxwell Street Foundation at gro.n1555621346oitad1555621346nuoft1555621346eerts1555621346llewx1555621346am@of1555621346ni1555621346 if you are interested in partnering to preserve and promote the legacy of this bus. Please put “Blues Bus” in the subject of your message. Or, message us on our Facebook page! Photo credit above: Lori Grove, September 2018. All images published by the Maxwell Street Foundation within this website are copyright of the artist and are for educational, personal, and/or noncommercial use only. For any other use, please contact gro.n1555621346oitad1555621346nuoft1555621346eerts1555621346llewx1555621346am@of1555621346ni1555621346.